Whoo hoo, Happy Birthday to me today! Boo Hoo, my husband is on the road with the Canberra Cavalry baseball team on the other side of Australia, in Perth. Seriously he couldn't be further away unless he left the country. So what is there to pep up a girl? Awesome nail mail. The best thing about all this nail mail is that it wasn't even for my birthday, it just arrived in time for my birthday. 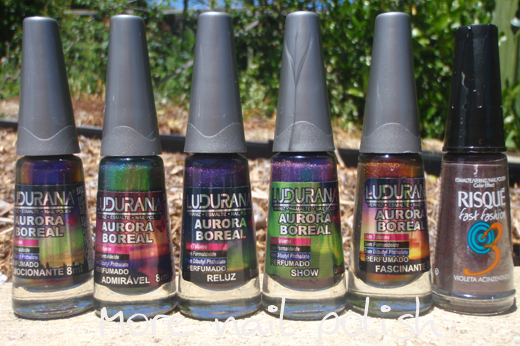 First is my Ludurana Aurora Boreal. I did a swap for these polishes with the sweetest Rafa from Nails Ink. They were wrapped in the beautiful way with purple bubble wrap and cellophane bags with hearts on them. It really was like opening a birthday present. Thank you Rafa! Next, after seeing Stefs post about Essence being available in Target, I did some googling and discovered that as of Thursday they are now available in every Target in Australia, not just selected stores. So I hauled arse over to the Canberra city target to check it out. Canberra ladies, don't bother checking it for a week or two, the display stand was well and truly picked over, with less that 1/3 of polishes left. 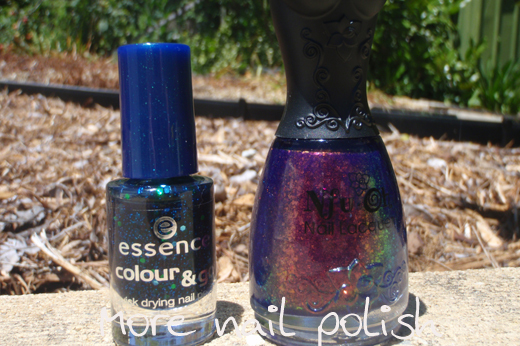 But the polish Gods must have been smiling on me, because there were still two bottles of Blue Addicted left. Blue Addicted is the dupe for Deborah Lippmann's Across the Universe, which after seeing Carli's post about it, I had to have. STAT! Sitting next to that is Nfu Oh #51. I have been trying to get this polish for at least two years. 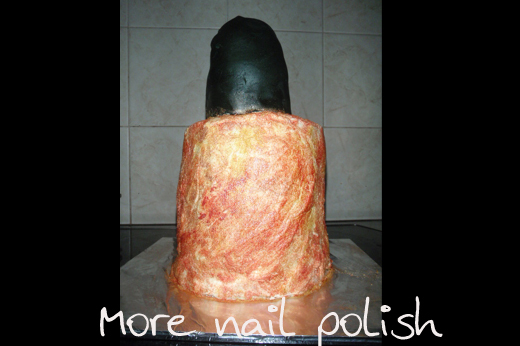 I had all the other Nfu Oh Flakes through Vivid Nails, but they were never able to get me this last allusive polish. The most awesome Erina got me this bottle. Thank you so much!! 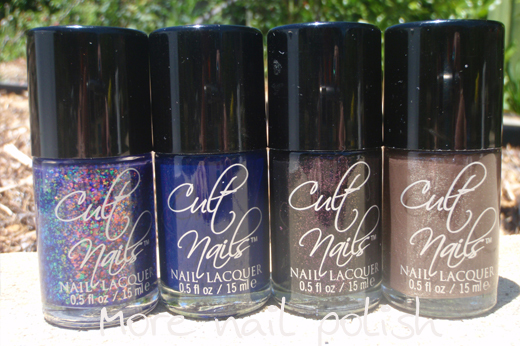 I received my Cult nails order. The Superheros collection. I can't wait to try them. Clairvoyant. WOW. It may seriously be the most awesome polish ever! There's a very cool looking duochrome one in there too - Mind Control. It looks to be a very special collection. Finally, I had a gathering with my family last weekend to catch up for my birthday and my Dad's, who's was the week earlier. I baked a cake. The ladies instantly knew what it was, but one of my brothers was scratching his head for a while. Not my best decoration, but it did kinda looks like a metallic orange gold bottle of polish. It tasted yummy too. I just don't have time at this time of year to do swatching, so it will have to be NOTD for all those bottles above. What a great haul! Those Ludurana polishes look so awesome. But so does everything else! I'm interested to see your swatches of them. Yum, LOTS of nail mail! Will have to look out for those Auroa ones...never heard of them before. Happy birthday! If memory serves, you actually own Ozotic 503 (*lemming*) - so if you find the time, I would love to see a comparison between that and Ludurana Admiravel. 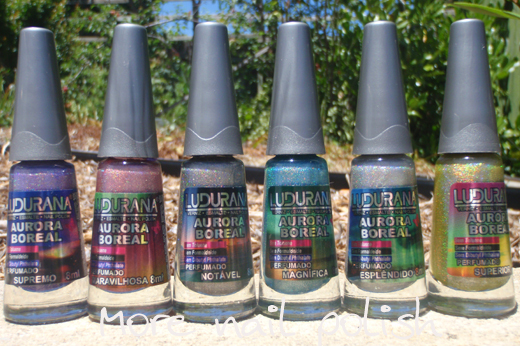 Actually how about comparisons betweel all the Ludurana multichromes vs Ozotics lol. So when I send is available to you!! I sent you an email regarding my SpectraFlair order just now. I hope you got it. Happy birthday! Wow, so many awesome polishes! I wish I could buy these in Italy!! Your blog is amazing! Ah, Clairvoyant/Unicorn Puke. I NEED this! Apparently they're out of stock now till February or some crazy far away date like that! Can't wait to see your swatch! Am prowling Vivid's online store for Nfu Oh. Seems I've become flakie mad overnight! I'm really overjoyed to see Ludurana and Risqué where you live. They're very pop in Brazil. These colors are amazing. I'm sure you're going to love this Risqué, Violeta Acinzetado... very elegant. And happy b-day even If I'm damn late, oh dear Lord! Happy belated birthday! I'm jealous of your luscious goodies. Can't wait to see you wear them all!